Automotive designer born in Whittier, CA. who, as a national award winner in the Fisher Body Craftsman Guild model car competition, was awarded a four-year scholarship to the Massachusetts Institute of Technology . He received a degree in mechanical engineering at MIT in 1949 and joined the GM styling staff as a junior engineer. He spent the 1950s in a number of different studios including Euclid where he developed a new look tractor. In 1953 he was named chief designer of the special projects studio where he designed the Aerotrain, A GM future locomotive concept. He then moved to the advanced studio designing Motorama dream cars: the Cameo show truck of 1955 and the Buick Centurion for 1956. He was instrumental in the design of the 1958 Corvette and the XP-700 Phantom Corvette concept car. In 1957 he was appointed Cadillac chief designer, where his team took tailfins to their peak with the 1959 Cadillac Eldorado. In 1962 he became executive in charge of all GM car and truck design. 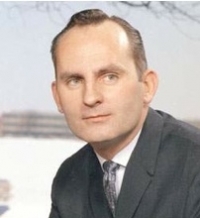 From 1967 to 1970, Jordan was design director for Adam Opel AG in Rüsselscheim, Germany. Upon his return he was appointed executive in charge of automotive interior design for Oldsmobile, Buick, and Cadillac, and in 1972, assumed a similar position for Chevrolet, Pontiac, and commercial vehicles. In 1977 he was named director of design for the entire staff, and when Irv Rybecki retired in 1986, he was named GM’s vice president of design, only the fourth man elected to that position. Under Jordan’s direction, his team developed the 1990s generation of Cameros and Firebirds, the Buick Reatta, the Oldsmobile Aurora, and the 1992 Cadillac STS. Jordan retired from GM in 1992, and spent time teaching car design to high school art students in southern California.